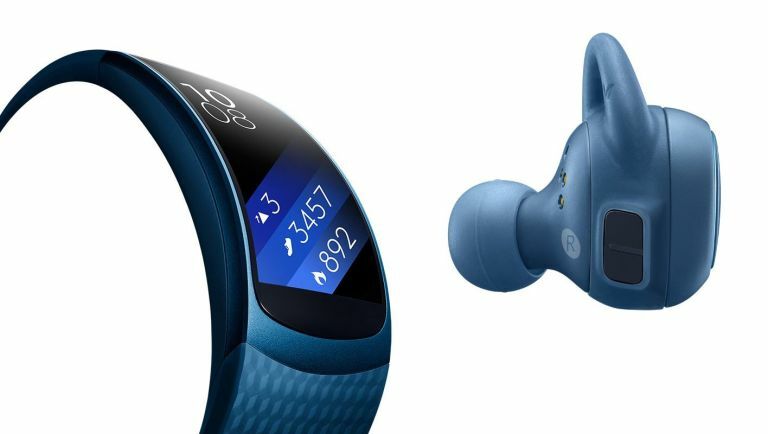 Samsung has revealed two new fitness trackers - theGear Fit2 and the Gear IconX. The Gear Fit2 is a cool tracker with a Super AMOLED curved touchscreen - an update of the original Gear Fit, it's pretty much a smartwatch and there's a heart rate monitor as well as GPS. The Gear IconX (see what they did there) are wireless earbuds that give audio feedback as you go. It doesn't have GPS, but it does have a 4GB audio player that works separately to your phone. Gear Fit2 touchscreen fitness tracker - it's almost a smartwatch! The standalone music player isn't dependent on a connected mobile device. It has 4GB of storage on board and you can use it with Bluetooth headphones (the band is Bluetooth 4.2 compatible). it's available in small and large and black, blue and pink. The earbuds weigh in at just 6.3g each and are 52g when in the case. Liked this? Why not read our guide to the best fitness tracker?